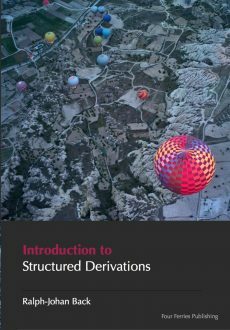 Structured derivations is a method for presenting mathematical arguments in a precise and easily understandable form. Structured derivations make it easier for students to follow and understand when the teacher presents a mathematical argument. 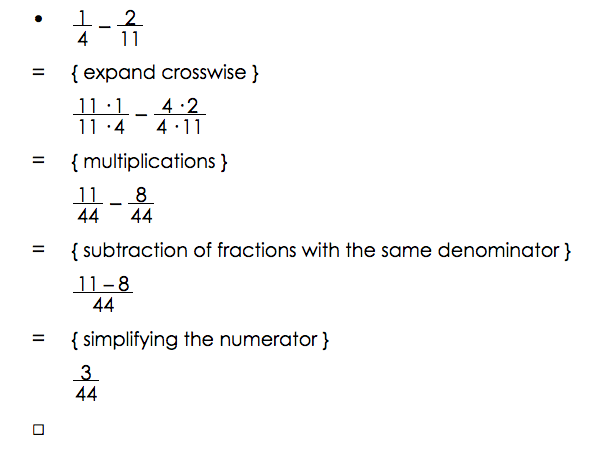 It gives the students a template for how to construct their own solutions to mathematical problems. 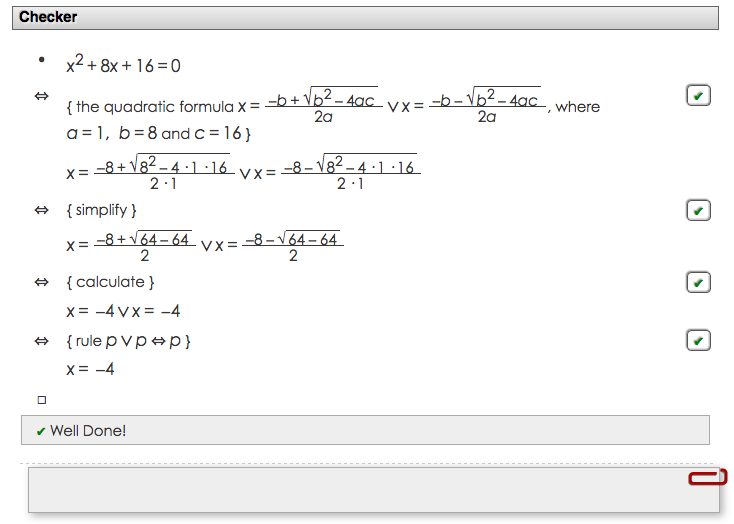 The uniform presentation format makes it easy to check and find errors in students' solutions. A structured derivation can also be analyzed by a computer, to check that the derivation is meaningful and that each step in the derivation is mathematically correct. 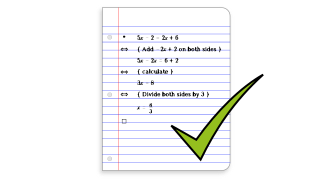 The format can be used for all kinds of mathematical arguments: calculations, solving equations, simplifying expression, proving theorems, geometrical constructions, and so on. Structured derivations can be used at any level of mathematics, from pre-algebra to university level, and can be used in any area of mathematics. This is a standard structured derivation calculation. We write the justification for a calculation step in a line of its own between the two expressions. The justification is written inside curly brackets, next to the equality sign. the relationship between the expressions is written out explicitly. This is a proof of a well-known trigonometric theorem. The proof starts with the task to be solved (after the bullet). The assumptions that we are allowed to make are listed and labelled (in parentheses). 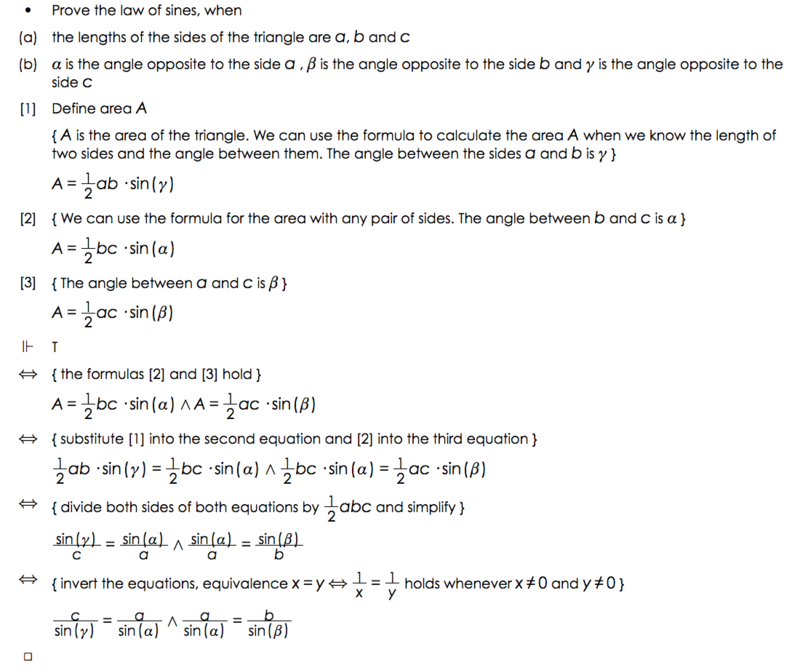 The definitions and mathematical facts following from the assumptions and general theories are labelled (in braces). The &Vdash; -sign starts the derivation. The empty square ends the derivation. 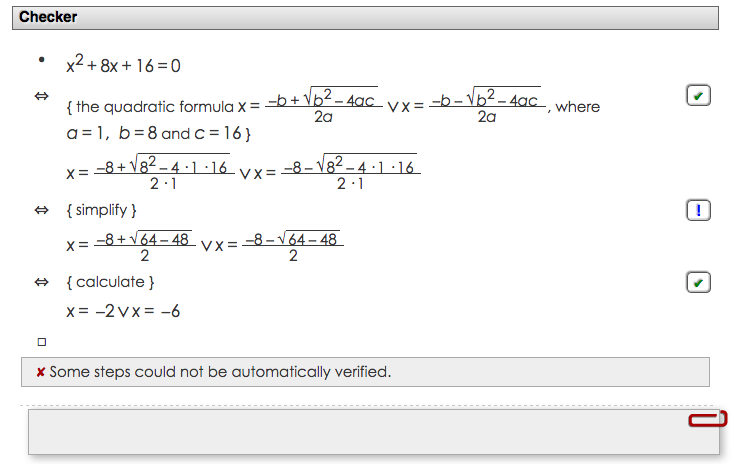 The checker goes through each step in the derivation here. It marks each step that it could not prove correct with an exclamation mark, Next picture shows the checking result after the error has been corrected.